ok but the fact u made that all on ur own a ma z e s me?? Well that was certainly a fall. 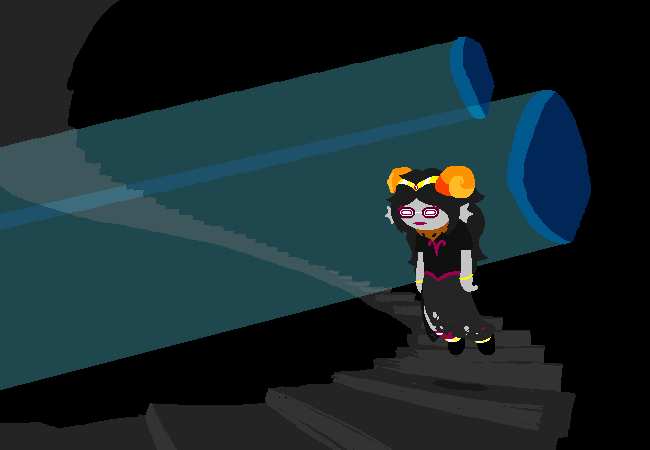 Kanaya panel! Not quite as visually intense this time, though I feel like that's maybe a good thing. You still wonder why the Jade human helped you make this. Peculiar at best and absurd at worst. 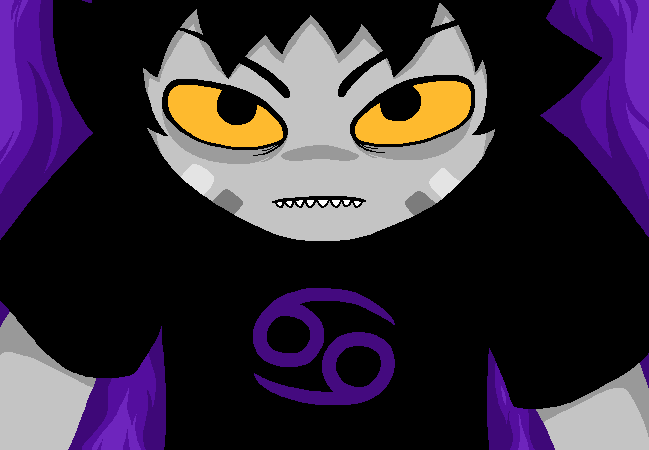 Here's Tavros! Boop dee doop. Oh, someone's going to pay for this. You swear on your grave. Nothing too complicated, but an angry crab all the same. Aahh. The smell of... Well, water doesn't have a smell, but the ocean sure does. The smell of the ocean. Smells like water. A very happy Guppeta. All is good in the world. You float down the stairs of your fortress of a hive. Nothing happens. As usual. 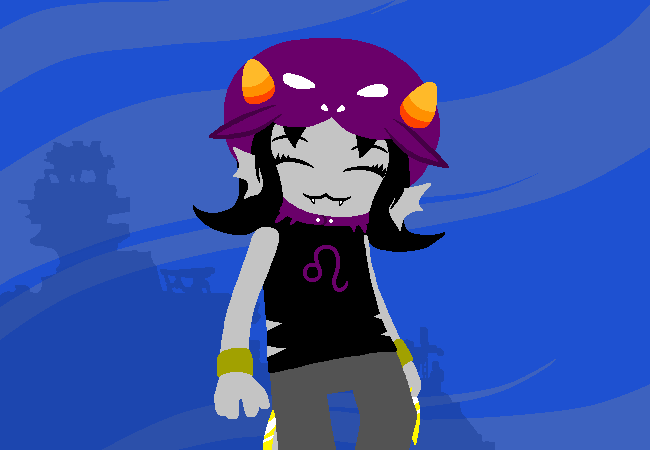 Aaand boom, Aradia! That's all the trolls! As I've been uploading these, I've also been working on bios that you can check out on the Tumblr, and as soon as I'm done with those, I'm going to have a pretty nifty announcement, so stay tuned for that! Hey, guys, I'm making a new game. So yeah, after about 8 months, I'm deciding to make a sequel to Mimicbound! This time, though, I'm aiming to take that game and crank those notches up to 11 because I want to go all out on this one. Because of this, I'm going to be taking more of an actual hiatus when it comes to making new content, instead of the mini hiatus I thought I'd be on when it came to making troll bios for the Tumblr. Last time, I got a bit of outside help when it came to writing and ideas, and that's how ambiguousTrials officially became the Transfusion co-creator and also my best friend. This time, I'm opening it up to you guys to help out as well! Because with such a big and ambitious project, I'm going to need a lot of help with this. Some things I'm planning on including this time! The ability to play as and talk to all twelve beta trolls, for a whopping 132 unique conversations at least. New (better) sprites more reminiscent of the classic Alterniabound. More and also better talksprites! Actual exploration this time, none of that 'single room' stuff. Some insight to the final boss fight in the troll session against the Black King, as well as their session as a whole. And more! Maybe? We'll see. Here're some roles I'm looking for. This would definitely be the best thing I could ask for, but I do know that finding a programmer is probably going to be a bit of a tough task, so I will say that this isn't deathly urgent or anything. If you do happen to have some programming knowledge, though, please PM me! I'd like to ideally leave this as an online Flash game, so having/obtaining a decent version of Adobe Flash would be something I'd ask for. 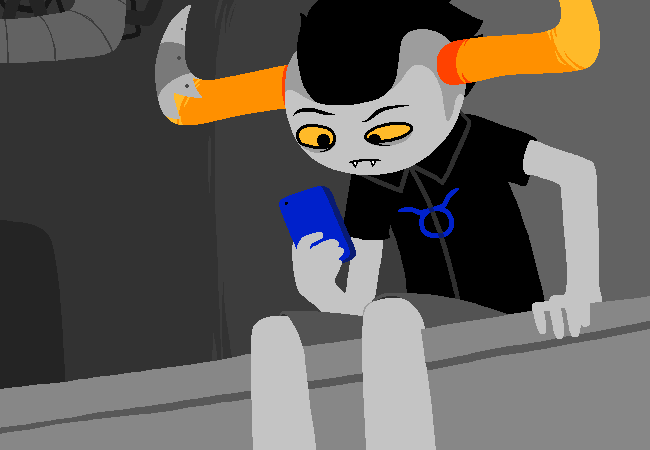 In terms of skill level, I'm really eager to try and match the quality and nuances of the walkaround games, similar to Past Karkat: Wake Up, John: Enter Village, Kanaya: Return to the Core and the Meenahbound trio. In Victorybound, there's going to be a bit of exploring, so you'll have to be comfortable working with bigger maps and collisions with walls and moving to new locations and such. I'm not sure if this is a complicated thing or not but the fact that I'm specifying here probably speaks of my experience. This one I'm going to need a few extra members to help, because writing 132 conversations is going to be a lot (and that's assuming I stick to the bare minimum (I probably will)). If you're interested, feel free to hit me up! I can't say that I'll accept absolutely everyone, but show me some material of yours and if I like it (and also feel like you can work on a team because, that's important, and stuff), then you'll be on board! Probably one of the lesser important roles, but an important one all the same, because bugs are bound to pop up. There's also opinion gathering, making sure that certain conversations work and make sense and if the sense of exploration is too much/too little, that kind of thing. I will note that anybody who wants to join the team is going to use Discord (if I recall correctly you don't even need an account? Although that'd definitely help), something you'll either enjoy or hate, depending on where you sit with DC. I just feel like it's the best for group projects like this. I'll be giving about a week before I actually start any work, but I'll be accepting/not accepting applications as they come! Please private message me about this sort of thing, since I'd like to keep this memo free of clutter if I can help it. I've got no idea when it's going to be done but hopefully the wait will be worth it! Look forward to seeing the responses. Gonna give this a boost on account of the forums going down at the time this was posted. Welp. Not much happening here, because I got distracted with a whole bunch of other stuff and also I think I am hitting the point where I'm slowly running out of new content to create for this AU. The game's on a bit of hiatus now for various reasons, but I will say that part of the reason why was because I've now got a whole nother AU: Terrestrials. The species swap to Transfusion's bloodswap. Check it out if you want, there's more coming there. In terms of this project, though... Whew. Man. Not a lot more to do. I'll see what I can scrounge up but you can expect more detail later. Right off the bat, though, definitely planning on revamping the sprites again. It's been long enough, they could do with an update.